I was contacted to see if I wanted to do a product review for Staples, and, of course, I agreed! I chose the Samsung Galaxy Note 8 to review. The model I received has 2GB of RAM, is WiFi only (802.11a/b/g/n), Bluetooth 4.0, and has 16GB of memory storage, expandable to 64GB via a microSD/HC slot. The Galaxy Note 8 is just the right size to hold in one hand, so I found myself keeping it n portrait mode most of the time, except for when using email, since the extra width is helpful then. It has a beautiful, bright, white screen which is the type of screen I like. I call it a "cool" screen as opposed to the "warm" screens of some tablets which are off-white. The Samsung Galaxy Note 8 has some useful features not found on every tablet. The first thing I noticed, and wondered why all tablets don't have it, was a full QWERTY and number keyboard. It was so nice not to go back and forth between number and letter keyboards, especially for passwords! The keyboard can also be split or floating, which some people prefer. The second cool thing I discovered was the ability to use a "face scan" instead of a swipe to unlock the device. (They give you a PIN back-up plan, too!) Now, I simply look at the lock screen and the Galaxy Note 8 unlocks! I also appreciate the inclusion of a physical "home" button on the front of the device. I would rather use a button than swipe through pages of apps to get to the main page of my device! Another nice feature allows you, when typing passwords, to turn off the brief display of the characters you are typing. I wish other tablets had this feature since, when I am projecting and presenting to an audience, they can always see my password as I type it! The Samsung Galaxy Note 8 also has an infrared port which allows you to turn your device into a remote control. In addition, if you have a Samsung smartphone or other Samsung device, there are ways to share your screen with those via the AllShare Cast app. I could not try the AllShare cast process since I did not have those devices. Samsung has thought of everything! On most tablets, you have to set the amount of time for when the screen will timeout. This usually causes you to make it longer than you need just in case you do need a longer period at some point. The Galaxy Note 8 includes something called "Smart stay" which causes the screen to stay on as long as you are looking at it. It looks for your eyes! The Samsung Galaxy Note 8 has really good handwriting recognition and turns your printed words into text. You can use the S Pen or your finger in any app that allows for text input to write your notes or emails! The tablet also comes with a Microsoft Office compatible application, called Polaris Office, for word processing, spreadsheets, and presentations. The Samsung Galaxy Note 8 is, of course, tightly integrated with the Google tools and apps, including Google Drive, Talk, Google+, Picasa, Maps, Local, Latitude, and the Play Music and Book Stores. Once you are signed in to your Google account, you have access to all of your tools and media! There is voice recognition in addition to handwriting recognition on the Galaxy Note 8 and any number of Samsung apps that take advantage of the S Pen for journaling, reminders, and note taking. The S Note app includes templates for taking all types of notes at meetings, in school, and while traveling. One type of note allows you to record both your drawing and your voice in real time. The recording and the voice recording are not put together, but you can easily view the drawing as it is created and start the voice recording to listen at the same time. As far as video playback goes, I did not watch any movies on the device itself but did stream both movies from Netflix and my soap opera via the SlingPlayer app, which allows me to watch recordings from my home DVR over the Net, and it performed well on both accounts with no stuttering at all! The speakers are mounted on the front and they are very loud! Of course, there are all types of accessibility options built-in to the tablet, too, including font size, background color, length of tap and hold, etc. The back camera is a 5MP camera, and takes good images. However, there are all types of settings you can use to enhance your photo. You can also take panoramic pictures or videos, cartoonize an image as you take it, have the camera wait until the person smiles to actually snap the photo, and more! Once the image is taken, it is easy to share it with DropBox, Facebook, Picasa, via Bluetooth, or to additional apps and sites. I was able to send the photo from the Galaxy Note 8 to a Nexus 7 tablet, but was not able to transfer it that way to my iPhone. Another perk with the Samsung Galaxy Note 8 is that is comes with 50GB of DropBox storage space for 2 years. That comes in so handy when moving files from device to device as well as sharing documents with others. You can also use Samsung Kies, which is Mac or Windows desktop software to sync your device and move contacts, images, and update software on the Galaxy Note 8 via a USB connection or wirelessly between the tablet and the desktop. There are some additional cloud solutions for back up, but I always like to have the back up on my computer. There are many choices for small size (7" and 8") tablets on the market right now. The Samsung Galaxy Note 8, with its large number of hardware and software options built-in to the device, has to be the most full-featured and fun one of them all! Full disclosure: Staples.com provided me with this product for review. The thoughts and opinions expressed are strictly my own. Feel free to shop their entire line of tablets online. I asked teachers to submit their grade level, an idea for use of the Wacom Bamboo Capture in their classroom, and an idea, if they had one, for use of the device with online classes, Webinars, or Web 2.0 tools. I used a random number generator to pick the winner, who is a Technology Specialist in a grade 1-4 school in Texas. My school lets our 4th graders sign up for various clubs that meet monthly throughout our year. I'm in charge of the Computer Club, and have for a while now, set up Glogster.edu accounts for the kids to show off their creativity. They've truly enjoyed it, but I've longed for a tool that would allow them to create their own items, rather than just do the typical Google/copy/paste thing. With the limited time I've got that's been our only effective method to date. With the Bamboo Capture at our disposal, I can just imagine the difference in what my kids can create! No more borrowing my iPad to use a drawing app; upload to my cloud acct. ; download to their Glog creation. Now... it shows up on their machine, they import it, viola! The kids now get to customize the products I've been dying for them to create from the beginning. This... it would be a game changer! Thanks. Editing graphics for yearbook and game design classes. I would love to use the Landmarker software to easily record the locations of all of the classrooms we connect with through online collaborative projects and Skype. I love the wireless feature! Would make it possible for students or teacher to demonstrate a technique in Photoshop/ Flash or share a project on the whiteboard from anywhere in the classroom! I teach Social Studies in a f2f environment and I am writing an online class this would be great for presentations. for both environments. I use maps and charts a lot and it would be great to use a tool like this to show trends and activities on maps. I have been using the original Graphire from your picture for a long time. I use the software "Deskscribble" (http://www.deskscribbleapp.com/) which is awesome. It gives me smartboard style drawing options, screen captures and more. I am able to face my class instead of turning my back on them. The Capture with this software would free me from having to always be at my desk. This would help with class management, as well as making it easier for students to participate using the tablet from their seat. Wireless would be great and I'd love to win. I think getting 11 years out of a $79 Wacom has been pretty good and it's time to move on. Thanks for your article! If I don't win, I'll be buying one. I immediately thought of the students who struggle with words for self-expression but use their hands, hearts and minds in thoughtfully illustrating their learning. The Bamboo Capture would be a fabulous tool to share with the many teachers I work with across the Northwest in my role as Technology Evangelist for Southern Oregon Education Service District, trainer Oregon Virtual School District, and NCCE Board member. Often, I use a new tool to launch a PD session to demonstrate its uses, then hand it off to a group of teachers for project-based learning activities within the PD. 12 Let students in technical writing course use it to annotate their screencasts while thinking what their audience will see and hear. I am making screencasts of Photoshop, Flash and Dreamweaver tutorials for my Multimedia class. Using Bamboo Capture would make this process so much easier and I could demonstrate more advanced skills because its challenging to draw with a mouse. I like using layers in Photoshop because I can create a rough sketch on one layer using the pen tool and then add a layer for the fill and another layer for the outline -- then hide the sketch layer. With the Bamboo Capture, I will be able to write out note, especially for struggling students and send them directly to their classroom iPads no run into the problem that these student struggle to keep up in class sometimes when we are taking notes. This way, they can still try but then will receive the regular copy to study. I teach in a Title I, large ESOL population that are learning to speak, read and write the English language. many are not literate in their native languages and have limited experiences, so vocabulary acquistion is difficult. I would use the Bamboo Capture by having my students learn vocabulary by drawing or animating words to be learned. I could also draw and animate for the students as a reference source. A graphic novelist Skyped with us and showed us how he uses something like that to do his drawings. It would be great to have one for the students to use as they work on their own brief comics. I would use the tablets for practicing Chinese characters, so the class could write and dissect them together, everyone learning from everyone else by displaying via projector; I cold also use it to draw and projectt so that students can watch me. I don't have an interactive whilteboard and this could get me started! It would be great to use with my document camera when we are solving math problems. I could demonstrate art techniques as well....maybe even do some cartooning with the kids. The handwriting recognition feature is great. I have the kids do math, idiom and vocabulary notebooks and I demonstrate notetaking. This would be a great way to record my notes electronically. Teach Symmetry. Students begin a simple geometric shape on one side of a drawn vertical line and a partner continues it on the opposite side as closely as possible to create a symmetrical shape. Using graphics like butterflies, faces, etc, students can visualize how symmetry is all around them. Grades 10-12 "I would love to have this to support grammar activities. With rough drafts displayed on the computer, I could let students take turns marking mistakes using editors notes. This would save a lot of paper and increase engagement! " I work with Life Skills students and this tool would be a valuable asset in helping these students to see their writing come to life in text. It would also help the teachers to read their writing more easily. Some of these students need to work on their fine motor coordination. I want to have remote control of my laptop that will be plugged into the projector to be more interactive and walk around the room while instructing. My students will create quick group logos, using the stylized, hand-drawn initials of each member of the group. These digitized logos will be printed or projected to identify group work on the bulletin board and to select random students for participation in class activities. Use it to develop skills inside Photoshop using the paint tools. Start with landscapes then progress to free art. I am planning to ""flip"" my classroom next year and will definitely need innovative photo editing in order to pique the interest of my students. When I create my short video clips, I can involve my students in the story prompts in the target language (Spanish.) I also believe that students would be happy to try this device as a way to contribute to the class with funny collage layouts of their fellow students. I think they would love to read bizarre (and appropriate) stories about each other. We could write a book as a class. Students could each add a chapter and/or paragraph complete with photos, clips, etc. in the target language. Show sketching and drawing on a screen for students to watch as I sketch, rather than on an easel and drawing pad. The software allows you to write on a white or black background, or what's on your screen. I write on top of pdf's everyday. The Bamboo Capture would be a perfect tool to support a Flipped Classroom initiative. It would be especially useful in schools who do not yet have wireless and do not have the money to implement tablets. Also, the Bamboo Capture would be an excellent tool for online and blended classes, because it would allow the teacher to do live online demonstrations using Webinar software and also capture the demonstration or explanation to post in the online class for other students. A teacher at my school uses a Bamboo pen to screencast math lessons because she finds it easier to write math problems and diagrams with the Wacom pen. She imports the math workshop into Photoshop and then uses Jing or Camtasia to create her math screencasts on her computers. In a tutoring situation, I frequently use sketches to help my students visualize concepts, from math to science to history. This tool would allow this dimension in online tutoring. We don't have the infrastructure for Webinars... but... I can see myself doing the next best thing and creating an unlisted YouTube channel for tutorials over our new tool. Bamboo Capture would be great tool for making visual graphs as you teach a lecture or even for a student to quickly take notes and have it organized quickly. You could illustrate flashcards with a photo or make a game with vocabulary. You could make flashcards involving the students in order to make the class more personal. You could illustrate a story with photos of crazy or bizarre scenes, however not inappropriately. ( It might take the mundaneness out of the online courses.) You could altar a relevant photo and students must express what is wrong or missing in the photo. Thank you to all who took the time to submit an idea! 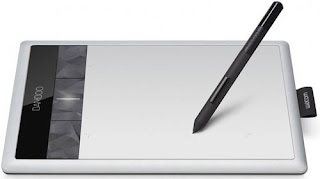 Do you use use a Wacom tablet in your classroom or have some ideas to share? Please leave a comment! Hum...lots of links. I looked at the bottom of the page to see the creator, and saw the other category links you see above, and then backed off the URL and got to the home page of the site, which you see below. Nothing wrong with this dating site, but I wondered what librarian would have students use a page from this domain in class. So I visited the Pinewood Elementary School site. It had the two pages below. I checked the WHOIS records to see who owned the pinewoodelementary.org site and it was a company that, for a fee, keeps your identity private in the WHOIS records and puts their company's information in the record. Again, nothing wrong with that, but why would a school want to hide their contact information in the WHOIS record? Needless to say, I am not adding the link to my page. Just be on the lookout for things like this. I wanted to lead you through the process I used to determine authority of author and reliability of source. Not so much. Anybody else ever get a letter like this? I received lots of tweets and emails from others who have had a similar experience. One educator shared the letter she received. The page the sender asked the person who received the email to add to her site, again, included information with no author. You can view the suggested page here. When I checked the WHOIS records for the laramiepubliclibrary.net site, the name of the administrator of the domain was the same company who protected the identity of the school site I looked up above. Guess this is more common than I realized! 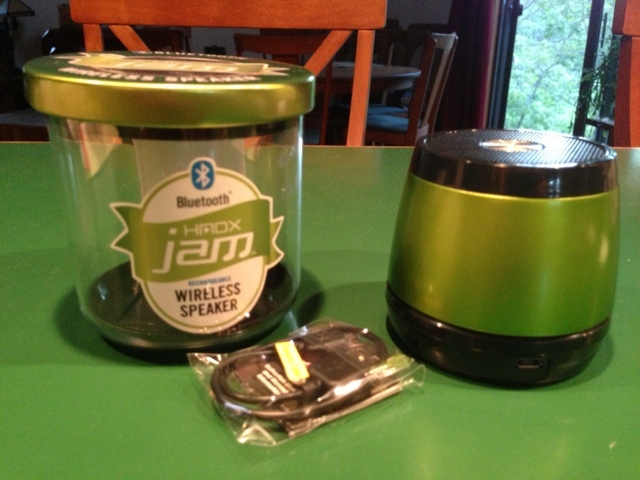 I recently received a Bakbone, a unique accessory for holding a tablet in one hand, and a HMDX Jam Wireless Bluetooth portable speaker. Here are my thoughts on these new gadgets! Want to easily carry your tablet safely with one hand while you use the other hand to tap, swipe and type on it? The Bakbone is an ingenious new accessory that works perfectly for this purpose! It is a great solution for those of you (or your students) who carry a tablet around the classroom or use the device to teach or present. The Bakbone includes two pieces. 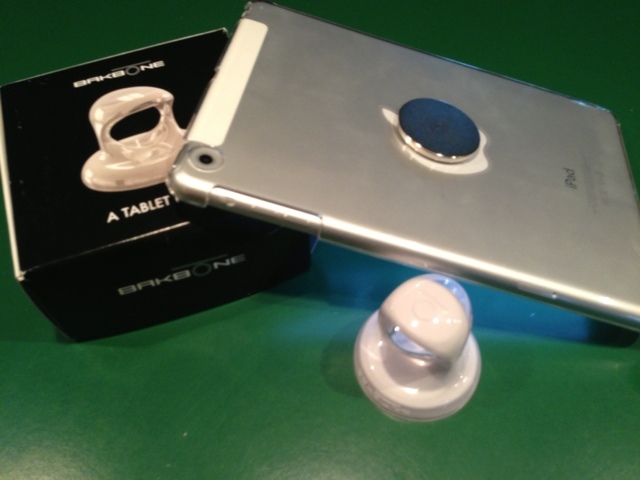 The first is a round magnet that you attach to the back of your tablet, or more likely, to the back of your tablet case. The second piece looks like a jewelry ring that attaches VERY strongly to the magnet. 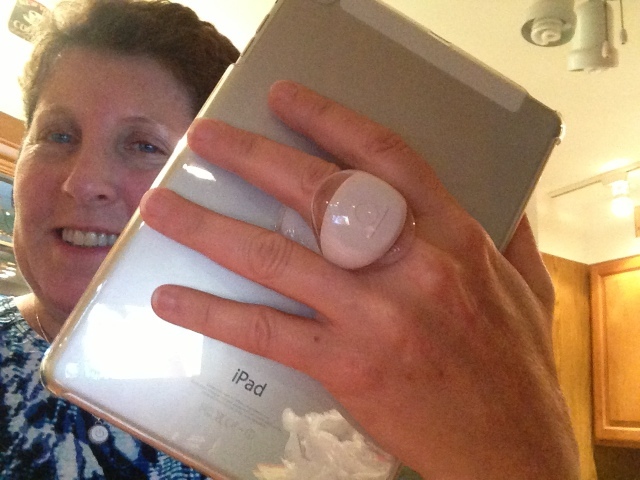 Once the ring is attached to the magnet, you simply put a finger through the ring and it is easy to hold the tablet with one hand. The best part of this solution is that you can easily rotate the iPad between the landscape and portrait orientations. The ring itself rotates-- there is no need to separate the ring from the magnet or take the ring off of your finger. The ring detaches from the magnet pretty easily, and instructions are also included in case you ever want to remove the maget (which is about 1/4" thick) from the back of the device or the case you have mounted it to. The Bakbone comes in white and graphite colors right now, with a pink one coming out soon. The compay plans to donate $1 to Breast Cancer Awareness for every pink one sold. I was also able to roam throughout the house carrying the speaker, straying far away from the audio source, so one could listen to music easily in various rooms. 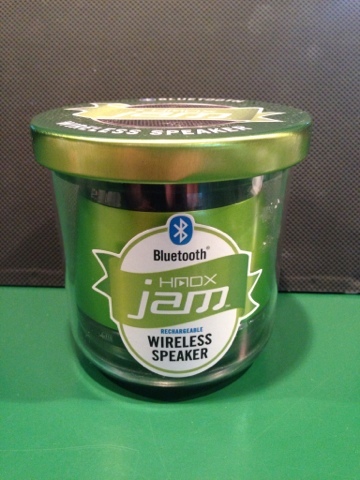 The HMDX Jam is available on Amazon here: (or at your local Bed, Bath, and Beyond for the same price if you have your 20%-off coupon!). Anyone have any experience with either of these devices or questions? Please leave a comment!